We are Andrew and Emily. Travel is a huge part of our lives and we wanted to share it with the world, in our own style. So, from our kitchen table in London, we created Along Dusty Roads. Since our launch in mid-2014, our website has enjoyed month-by-month growth to become a respected and trusted voice amongst the travelling community. In 2018, we were even named 'Best UK Travel Blog' as well as G Adventures 'Wanderers'. 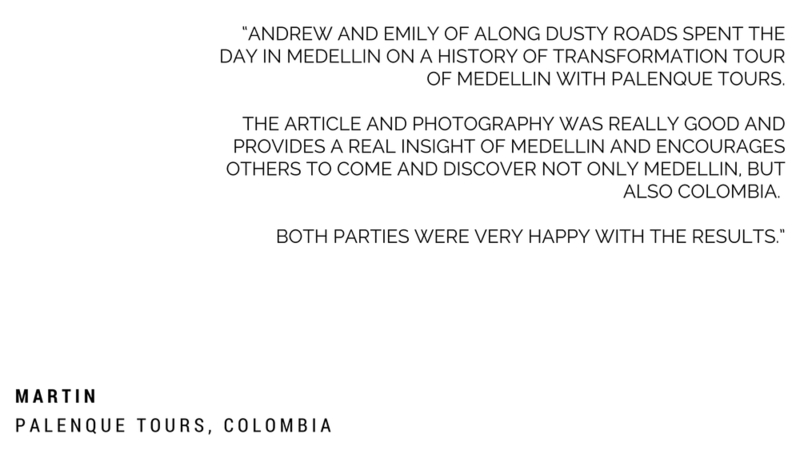 After two years exploring all that Latin America had to offer, we're now based in London. But that doesn't mean the adventures have stopped - we have big plans to see and conquer the world (and tell our readers all about it). We want to inspire and inform the current and next generation of wanderlusters to explore, dream and discover. Traditional media and guidebooks are no longer the first port of call for people researching their next adventure. Instead, on-line search is increasingly popular amongst backpackers and other independent travellers. They want to read the personal experiences of people like them. Of people like us. Your audience is our audience. By partnering with us, you can better reach thousands of them. If you are a travel company looking to improve your on-line visibility, influence and brand messaging, we can help. 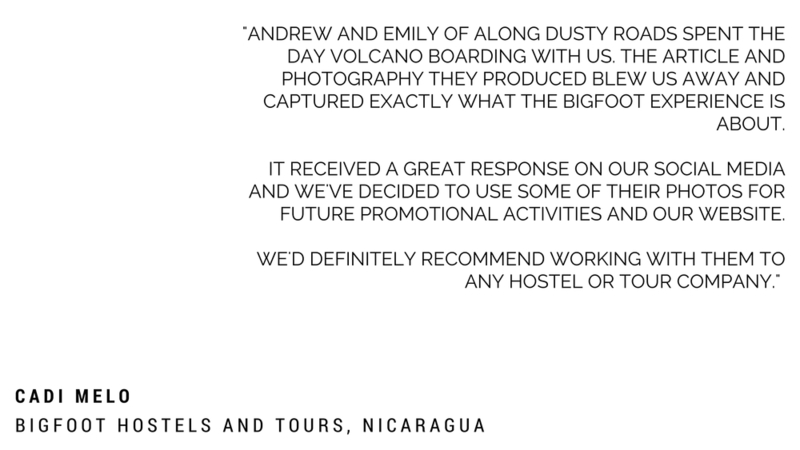 In a highly competitive travel market, the award-winning Along Dusty Roads can help you stand out from your competitors. There are many ways your story can be told but we choose to combine beautiful, stylish photography with our own voice and personal touch to bring alive every place that we visit, product we use or experience that we have. And with our knowledge of blogging and SEO, your story will rank highly in search engines and still be told for years to come. Whether you have a new experience to promote, want to harness our social media presence or simply need stunning photos to show off your business, there are a variety of ways we can help you to achieve your goals. Have you got a cool or unique hostel, restaurant or coffee shop that travellers should know about? How about a new travel product, adventure tour or attraction you want to promote? We are happy to visit you or try out your product, take photos and write honestly about our experience. Want to promote your new product or experience? Posts can be written by Andrew and Emily to fit with our voice whilst also giving exposure to your brand. The article would be promoted across all of our social media, and featured on our homepage for a fixed period of time. We think our photography gets under the skin of a people, a place or an experience. Does your website need a boost with some stylish photos of your business or tour? Or would you like to purchase some of our travel shots to use as you wish? One photo can inspire a thousand travellers. A great way for a start-up business to promote themselves amongst travellers is via contests or giveaways. We are happy to work with you to drive interest and participation, to ensure your name reaches the right people in the travel community and gets the widest exposure on social media. Put us on plane and take us with you! We will write rich and engaging content throughout our trip alongside stunning photography to really show off your destination and prick the curiosity of readers looking for their next adventure. Be the next stop on everyone's bucket-list! We're very fussy about how we use space on our website. However, we'd love to work with the right brand to promote you via side-bar, banner advertisements or in-post links. We may be picky, but we know Mr. or Mrs. Right is out there somewhere. Editorial control and authenticity are incredibly important to us. We will only work with brands and businesses that promote the sort of travel experience both we and our readers value. We operate on a policy of full disclosure. Both of us place great pride in creating professional and beautiful content and putting 100% into every project. Send an e-mail to hello@alongdustyroads.com outlining the details of the opportunity - or asking for our ideas on a project - and we'll be in touch. Our rates are available upon request, as is a complete media kit. If there are any further ways you would like to collaborate, which aren't listed above, just let us know.